The Raford Inn near Healdsburg is located in the Russian River Wine Region just a half mile from the Russian River and 15 minutes Southwest of the Healdsburg Square. Gently perched above the valley on four acres, graced with majestic palms, this country bed and breakfast overlooks vineyards and cropland ringed by redwood-forested mountains. 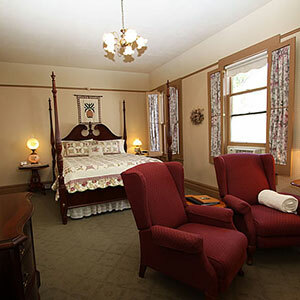 Lovingly preserved, there are five comfortably elegant guest rooms; all featuring private baths, queen or king beds, and a full, hot, gourmet country breakfast served every morning. If it's the regions best you're seeking, the estate vineyard on the property is farmed and turned into award-winning wine! For more than 30 years, the Raford Inn has provided B& guests a comfortably elegant stay in Sonoma County Russian River Valley wine country without the busy feel of downtown Healdsburg. Come and enjoy the enclosed sunroom and wrap-around veranda. Gaze through the towering palm trees across the grape vines and step back into a time that has not quite yet gone by. As wine country experts, we welcome the opportunity to help plan your itineraries, wine tours, activities and dining reservations. While staying at The Raford Inn, enjoy a massage by one of our experienced certified massage therapists in the privacy of your own room, or in our peaceful spa room. 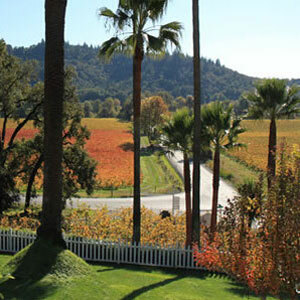 Enjoy the complimentary local wines and hors d'oeuvres, while you absorb the beautiful valley views and sunset. 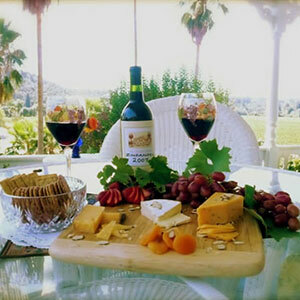 The innkeepers can provide dinner suggestions as well as assist with your wine country itinerary! Raford makes every effort to be sustainable and eco-friendly! The estate is farmed by the innkeepers and turned into award winning wine!